I'll even tell you what I'm making, where it came from and how to get your own. Soon. Right now it's stealthy. Very very stealthy. 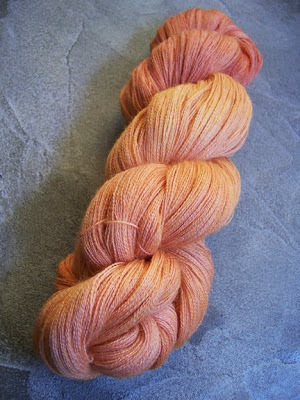 I can tell you that it's laceweight alpaca and it is totally and absolutely scrumptious. Mmmm hmm! I'm trying to think back to my early days of knitting lace. I think a class should teach how to read the stitches. Knitting lace gets so much easier once you can see the pattern emerging. I'm not sure if that's something that can be taught or if it just comes with practice. I'm going to assume that's a real question and not merely rhetorical ... I'd LOVE a class on the many ways to knit together (K2tog, ssk, k3tog, etc.). What are they? How do they change the appearance of the fabric? How does one choose the best way for a particular pattern, to achieve a particular look? Design lace one's self? Any tricks for maintianing concentration as one travels across a row would be most beneficial. That's where I lose it. I put my rows separately on index cards and do o.k. until I start feeling confident then the mistakes come. Also how to "read'' the lace to make it easier to see where the mistakes are so I don't have to frog and start over. OK, I'm repeating: Mmmmmmmmmmmmmm. It's absolutely luscious! I love lacework, but I'm always nervous about messing up because I can't tink back as easily as I can with non-lace projects. I can't "see" what to fix. Liberal use of stitch markers (even adding them when they aren't called for) as tactile reminders of pattern repeats. I would love to take a lace class. My biggest struggle w/ lace right now is maintaining concentration. I'm not sure you can teach that in a class, though. The yarn is, indeed, yummy! One of the most helpful things I've discovered/learned about knitting lace is looking at an entire pattern/chart and breaking it into parts, and understanding how the parts/repeats build on each other. Once I understand how the increases work and where they come in, and the sections of the repeat that make sense to me, it's easier to keep track of the pattern. So excited to be signed up for the Summer of Lace. I've selected the Swallowtail with beads of course, but have a question. How does one maintain their palce within the row of a chart? I have a magnetic board that I keep the pattern on and the row is easily found but my problem lies in finding my place within the row. when I look up from my knitting to refer back to the chart. I need to have all this mastered so I can begin my great Summer of Lace challenge! Rosemary- I'm a lace newbie. So some things that would have been helpful- YO's on the back side, reading charts (a written pattern is so much more difficult because you can't see the pattern), and of course, fixing mistakes. I frogged and tinked for 2 hours last night- there must be a better way. Tips and Tricks to keep track of your place in the pattern. How to attach borders like on Shetland lace. How to shape lace in a garment - how to increase or decrease in pattern to shape armholes etc. Romi, I agree with PurlPoet - the varying increases/decreases and how they change the look would be right up there. So would different ways to start a circular piece, how to attach edgings, and a basic for any knitting class, how to substitute yarns. Seeing as how it's lace, how to block, and to use markers and lifelines is essential, too. Is that Lisa Souza's agua fresca color? It's beautiful. I love knitting with her baby alpaca, and you can use size 6 needles with it--the fiber has a lot of energy to it spun in that weight. I would have loved to know how to do a "life-line" early on... and how to fix mistakes without ripping out inches of knitting. 1. How to chart a 1/4 of a circular shawl. 3. Different methods of attaching/adding lace edging. 4. How to knit the edging as you go, rather than adding it after. 5. How to chart mitered edging corners. 6. How to chart a lace pattern from looking at a photograph or sample. 7. How to fix a mistake without ripping back several rows. For example, how to fix a dropped stitch that incorporates a double decrease, etc. 1. Put in lifelines often! 2. Learn to 'read' your lace - i.e. if the chart shows a decrease above a YO and your stitches are off by one, don't keep knitting to the end of the row, find the error now. 3. Always block your swatch!!! Unless you've used that yarn before, each one blocks differently. 4. Knitting through the back loop above a yarn over produces a much neater, 'tighter' and more defined pattern, rather than big sloppy spaces. Romi, you are an evil temptress and a tease. I wish I had figured out how to read my lace sooner than I actually did. That was a huge help. I would love to learn how to do knit-on edging in a class. I'm still trying to wrap my head around how one does the corners. Also I would love to learn how to take a square or round pattern and make it half the size for a shawl. I swear I'll figure it out sooner or later, but a learning how to in a class would be lovely. It depends on whether it's a beginner's class or advanced. I think for beginners they'll need to know how to do a provisional cast on, the slanting decreases, how to know which way to make your yarn go over the needle for a knit or purl, how to read charts, keep tension, lifelines, reading the charts, understanding how to make mirrored images if the pattern doesn't spell it out, how to block. I think having small samples of how a lace pattern looks in different yarns would be good info, as would a before and after blocking example. Will you have a contest for that yarn that only I can win??? I love knitting lace. The most important thing I found I needed to learn ... and did, was to read the previous row as I knit the next. The 2nd most important was to find out that adding or taking away a wrap is so easy once you know how. M-m-m-m-m, alpaca lace is sooooo soft! Loved your post. What lovely yarn. I have been remiss in my attention to knitting lately. I am going through a blahh...thingy. I am a new lace knitter, and I have problems adding a new skein and also with weaving in ends. I know there is a simple solution to both, but show me how please! Pretty. Reminds me of orange sherbert.